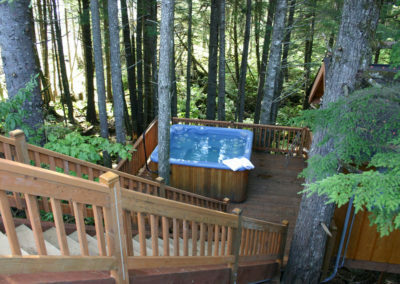 Adventure Alaska Southeast, LLC provides you with a cozy home-away-from-home atmosphere. Our cottages are clean and comfortable. 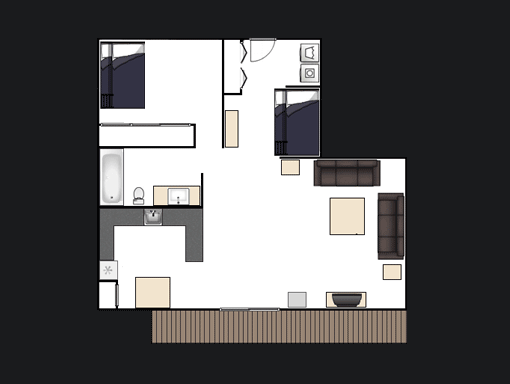 The layout includes a covered front porch, kitchen area, living room area, separate bedroom with a twin & full bed and private bathroom. The Eagle cottage is a one bedroom cottage with a small living and dining area, small kitchen and a large covered front porch. The bedding arrangement is a full-over-twin bunk in the bedroom as well as a pullout in the living room. 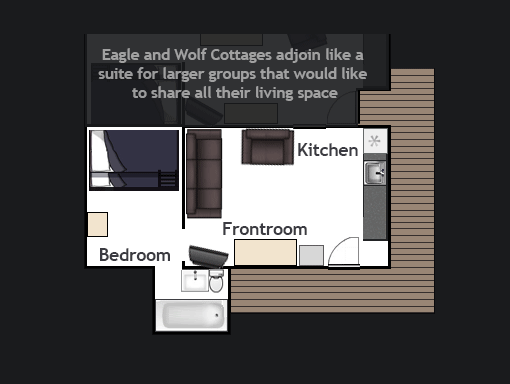 The Eagle cottage is comfortable for 3 people (or more if there is a couple in the party.) The Eagle and Wolf cottages adjoin with double doors that lock on each side. Each has it’s own exterior door as well. The adjoining cottages may be ideal for a family or two couples who would like to be close yet have separate living space. Whatever the case, these two cottages can be used separate or together. There is a laundromat on site as well. Wolf Cottage is a one bedroom cottages with a small living and dining area, kitchen and a covered front porch. The bedding arrangement is a twin over full bunk in the bedroom as well as a pullout couch in the living room. The Wolf and Eagle Cottages are adjoining cottages with a door that locks on each side, as well as each having its own private exterior door. The adjoining cottages may be ideal for a family or two couples who would like to be close yet have separate living space. Whatever the case, these two cottages can be used separate or together. There is a laundromat on site as well. Blacktail Cottage is also a one bedroom cottage with a full living room, dining area, kitchen and covered porch. 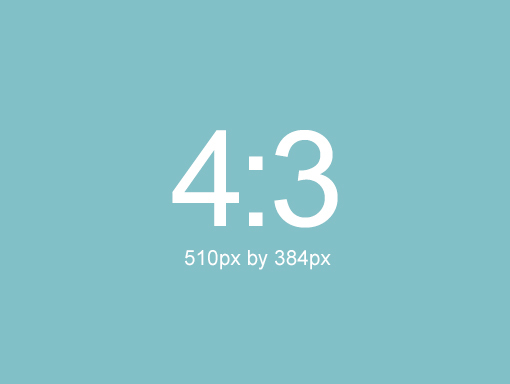 It’s 10 ft ceilings and natural light skylight give it a spacious feel. The bedding arrangement is a twin over full bunk in the bedroom and a pullout couch in the living room. 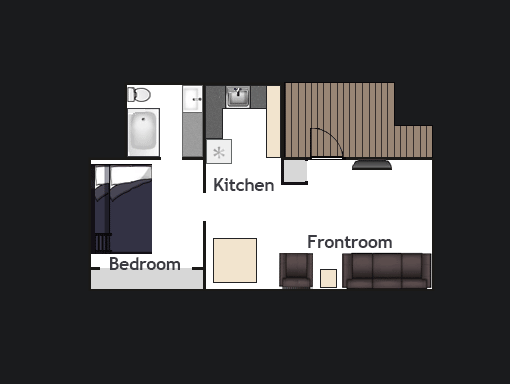 The Bear cottage is roomy two bedroom cottage with a full living room, dining area, large kitchen, washer, and dryer. 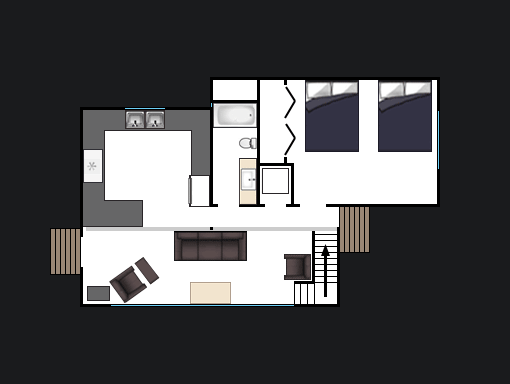 Each room has two beds, (One room has a full size bed and a twin, other room has twin-over-full bunk) see the link below for full bedroom layouts. 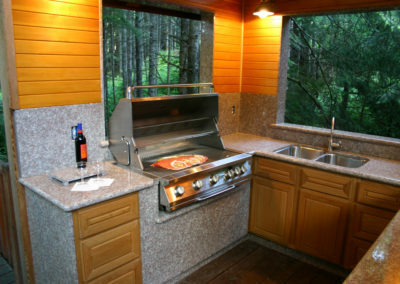 The large kitchen is great for preparing meals and dining as a large group. There is plenty of space for relaxing in the living room. The House is a complete house. It has two bedrooms with an very large living room, cozy dining area, large kitchen with bar, dishwasher, washer & dryer and covered front & rear porch. The kitchen layout is great for preparing meals and dining as a group. One bedroom has a twin-over-full bunk. The second bedroom has two full beds. There is a pull-out couch in the living room. The Residence easily sleeps 4 people or more. 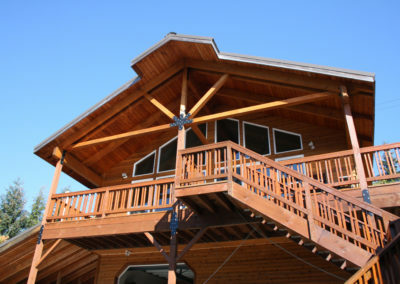 The cabin is a chalet-style two bedroom, two bathroom cabin with loft. 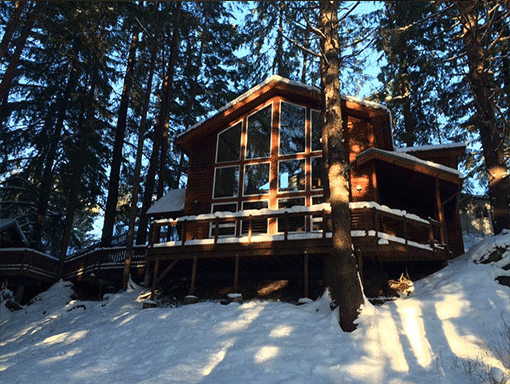 Nestled within the woods, the chalet is our largest cottage. 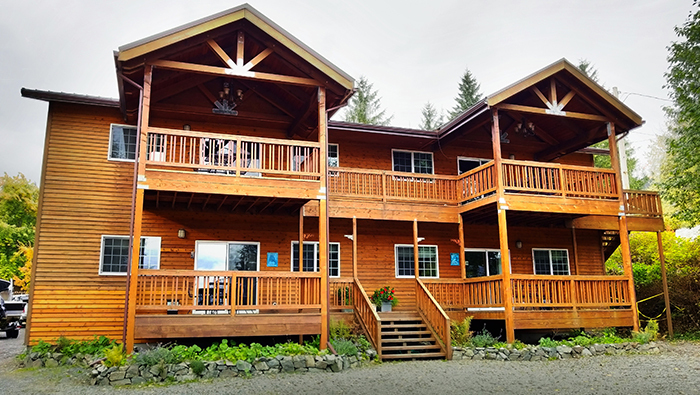 Its spacious vaulted ceiling and full view front windows give the feel of really living in the Alaska rainforest. There are two full beds in each room and two full beds in the loft (6 beds total). 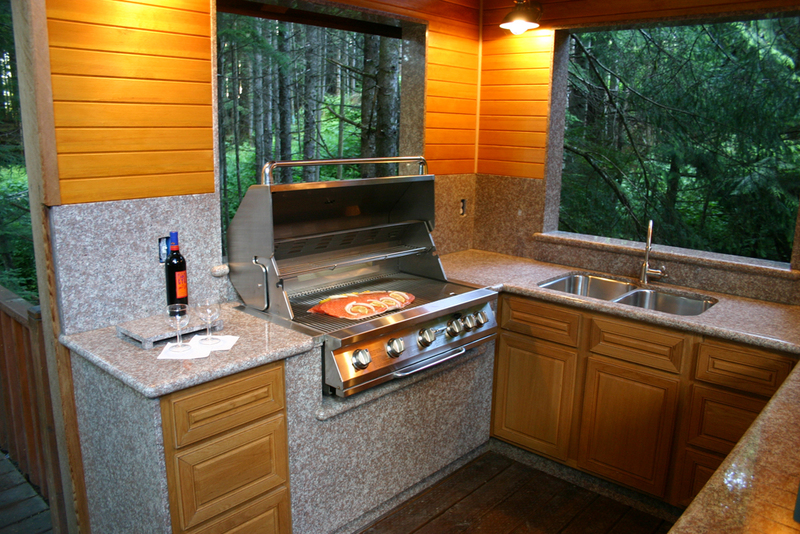 The Chalet has a full kitchen including dishwasher and washer & dryer. 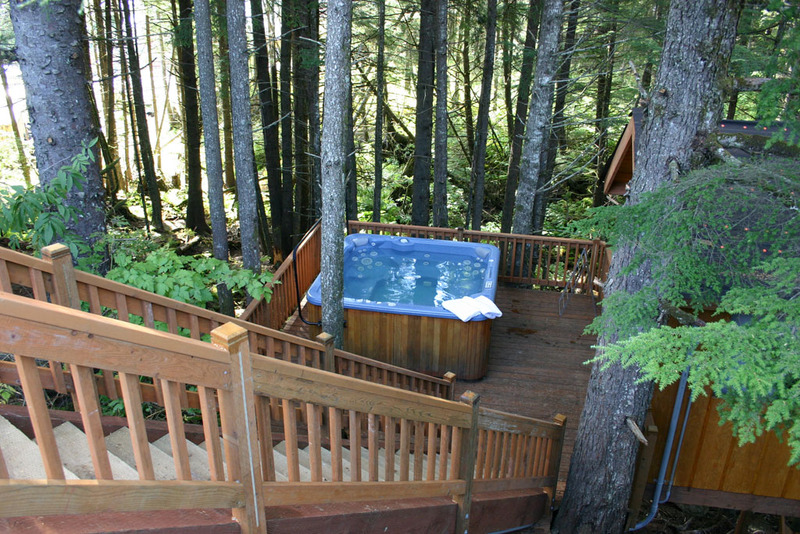 It has a great view of our woods and is located next to the creek and hot tub. The Chalet is perfect for family trips, or multiple couples! The Trout cottage is a roomy one bedroom cottage with a full living room, dining area, large kitchen, washer, and dryer. The large kitchen layout is great for preparing meals and there is plenty of space in the living room. The bedding arrangement is two full beds in the bedroom as well as twin bunks in the nook area. 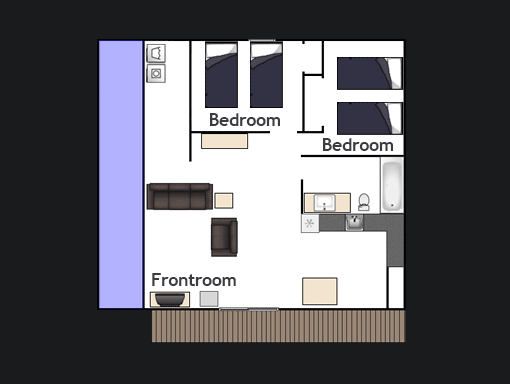 (please see diagram) The Trout cottage is comfortable for 4 single people or more. While we are not located waterfront, there is a view of the bay from the windows as well as the front deck. The Steelhead cottage is a roomy two bedroom cottage with a full living room, dining area, large kitchen, washer, and dryer. One room has two full beds, the other room has a twin and a full. 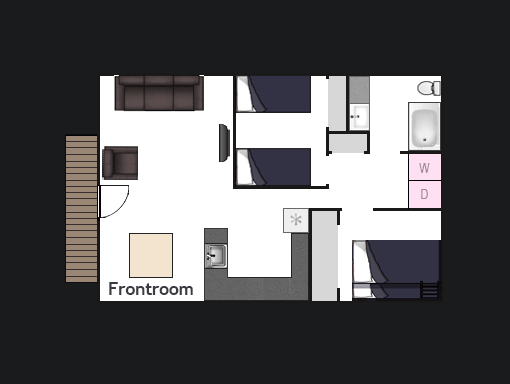 See the link below for full bedroom layouts. The large kitchen is great for preparing meals and there is plenty of space for relaxing in the living room. 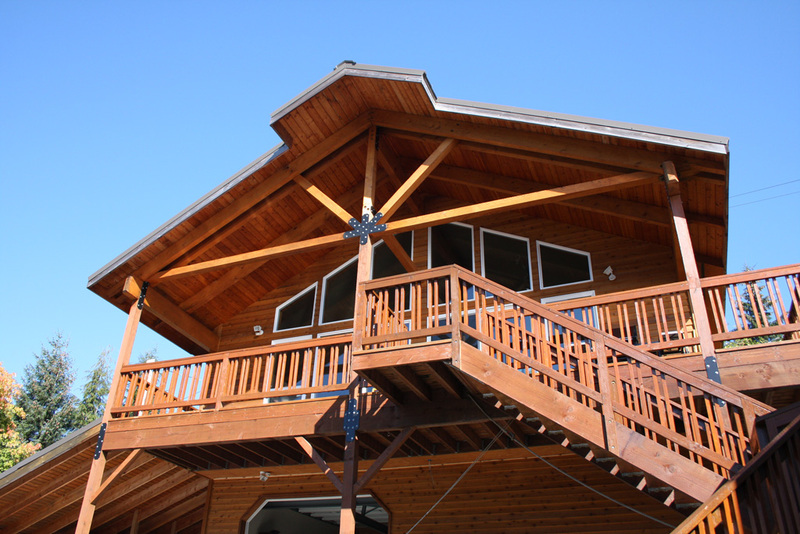 While we are not located on the waterfront, there is a view of the bay from the Steelhead windows as well as front deck. The Salmon cottage is a roomy one bedroom cotttage with a full living room, dining area, large kitchen, washer, and dryer. 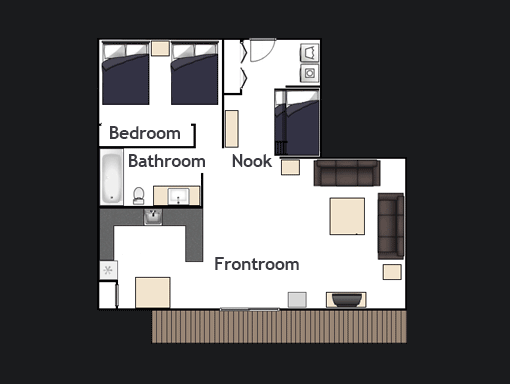 The large kitchen layout is great for preparing meals and there is plenty of space for relaxing in the living room. The bedding arrangement is two full beds in the bedroom as well as twin bunks in the nook area. 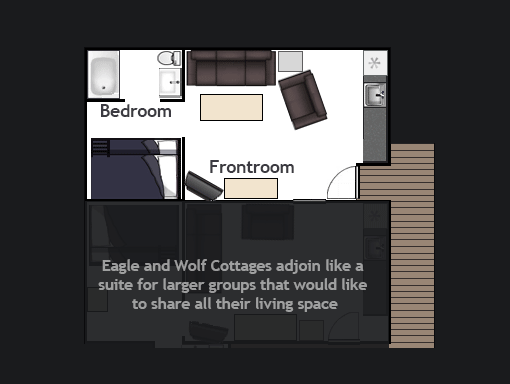 (please see diagram) The Salmon cottage is comfortable for 4 single people or more. While we are not located waterfront, there is a view of the bay from the windows as well as the front deck. 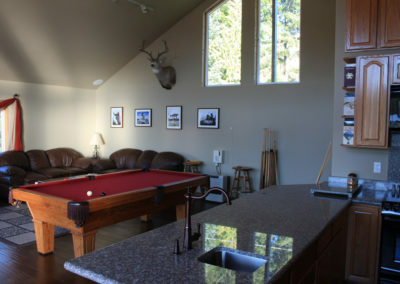 The Halibut cottage is a roomy two bedroom cottage with a full living room, dining area, large kitchen, washer, and dryer. 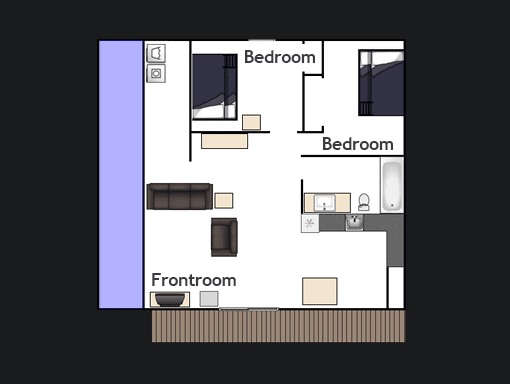 Each room has two beds, see the link below for full bedroom layouts. The large kitchen is great for preparing meals and there is plenty of space for relaxing in the living room. 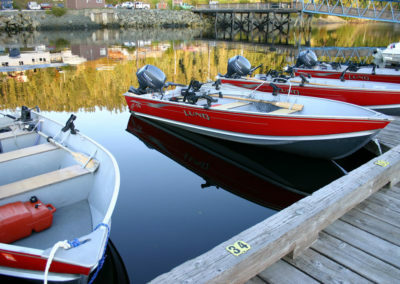 While we are not located on the waterfront, there is a view of the bay from the Halibut windows as well as front deck. 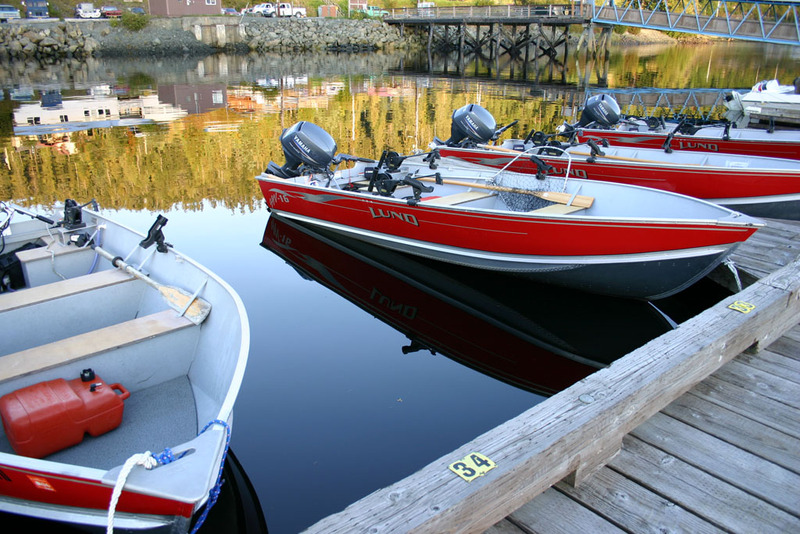 Adventure Alaska Southeast, LLC provides you with a cozy-home-away-from-home atmosphere. Our cottages are clean and comfortable. 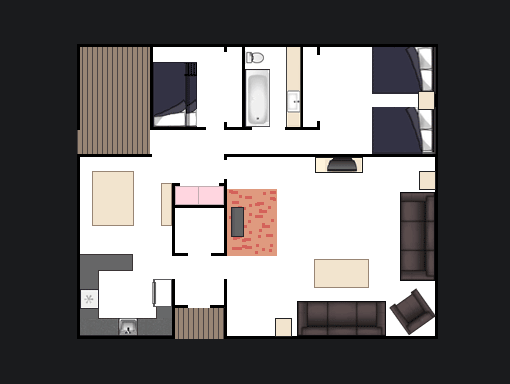 The layout includes a covered front porch, kitchen area, living room area, separate bedroom with a twin & full bed and private bathroom.